Flooring is one of the largest investments you will make in your home. It’s a decorating choice that you will enjoy for years. Resista Floor Care is the complete line of floor care products uniquely formulated to help you easily clean and maintain your floors. You get professional looking results without having to call a professional! The Pet Stain and Odor Eliminator is exceptional at removing tough pet stains and odors. The patented formula stops urine decomposition and knocks odors out immediately. Highly effective on everyday spot and stain removal. Water based and safe on all carpets and rugs. 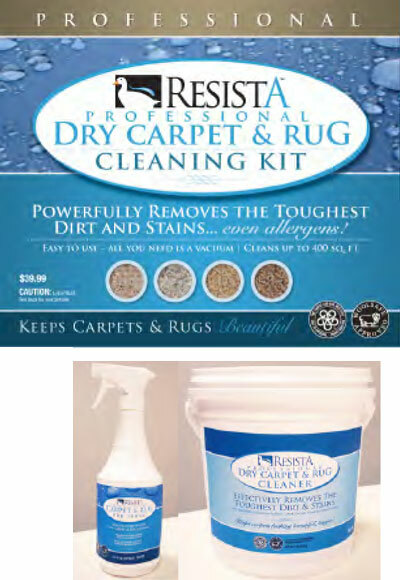 Resista Hardwood Floor Cleaner offers superior cleaning without leaving residues and streaks. How? Lower surface tensions! The lower the tension, the better the cleaning and fewer streaks! Resista Resilient Cleaner is blended to be the very best for resilient care. The formula is a special blend of surfactants, ammonia that provides superior cleaning performance that leaves a beautiful shine after drying. Resista Laminate Floor Cleaner also contains a special blend of surfactants that clean without streaking. Contains no vinegar or ammonia. Resista Ceramic Cleaner is specifically formulated to clean ceramic.High performance surfactants have low surface tensions to lift tough stains and dirt from tile. 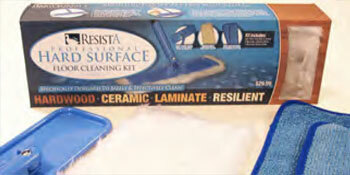 The Resista Hard Surface Cleaning Kit is the perfect tool to help customers keep their floors looking beautiful. The Electrostatic Cloth lifts dust, dirt and hair that build up and scratch floors. Visit our Care For Your Floors and Remove A Stain pages for more help.